The AA Navigator TMC 2006 satellite navigation system provides real-time spoken directions as you drive and automatically re-routes if you miss a turn. The AA Navigator TMC 2006 satnav uses the latest 2006 Navteq maps for the UK and Republic of Ireland giving optimal routing for any distance and with full UK 7 digit postal code search. AA Navigator 2006 TMC has been discontinued. The AA Navigator TMC 2006 includes precise male or female voice guidance including road numbers and fast re-routing to handle any driver mistakes or wrong turns. A 3D navigation display offers a fantastic overview of the roads including road names and also provides intuitive menus and touch-screen buttons for easy input. Register the AA Navigator TMC 2006 satellite navigation for free six month AA SpeedCare updates providing visual and audible directional speed camera alerts of all six UK speed camera types - Gatso, SPECS, Truvelo, Mobile, Temporary & Redlight. (PC and Internet connection required). 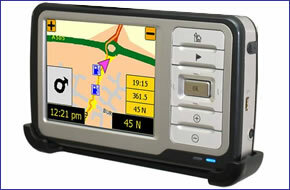 The AA Navigator All In One TMC 2006 satellite navigation comes with an MP3 player & digital photo viewer. The AA Navigator TMC 2006 also comes with a lifetime subscription to AA Traffic information via the TMC (Traffic Message Channel) FM receiver. The TMC function gives the AA Navigator TMC 2006 the ability to automatically re-route the driver and avoid any traffic congestion, constantly updating traffic information on the move. The AA Navigator All In One TMC 2006 256 MB SD card incorporates AA Navigator software and maps of Great Britain and Northern Ireland. Also included is a lifetime licence to the AA's traffic service, with no additional fees or subscriptions.